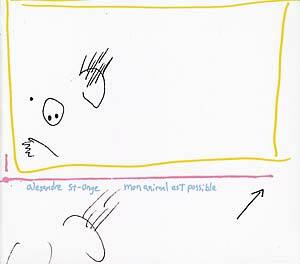 "Mon Animal Est Possible is a collection of electronic love songs written and conceived by Alexandre St-Onge, whose purpose behind the recordings was to try to communicate with monsters and exorcise/exercise his own monstrosity through them, thus making possible his own animal. A collection of eight pieces of just under 40 minutes, Mon Animal Est Possible reveals St-Onge at his most melodious and sensuous thus far. The album is largely centered on vocals, both those of St-Onge and his partner Fanny. This is the polar opposite of his debut solo effort released by Alien8 back in 1999; St-Onge has traded in massive passages of near silence for lush ballads and love songs filled with vocals and cinematic backgrounds. It is rather difficult to draw contemporary comparisons to this recording, although one may be reminded of the recently reissued classic L'enfant Assassin des Mouches by Jean Claude Vannier. In terms of more recently released music similarities could be drawn to the experimental passages from vocalists like Scott Walker and Robert Wyatt."